Do you experience difficulties with the process of window cleaning around your house? Your struggles are not enough to wipe stains, water streaks and dust build-ups from glass surfaces? The specialists of window cleaning in Monument will help you out! Say farewell to the innumerable hours of polishing and wiping – the skilled and experienced team will handle this burden. You will be able to enjoy your free time – just let us do this time-consuming and tedious task for you. Our professional approach will grant you lots of benefits. We also provide our professional services in nearby areas: Tower Hill, Ludgate Hill, Fenchurch Street, Blackfriars, Fleet Street. 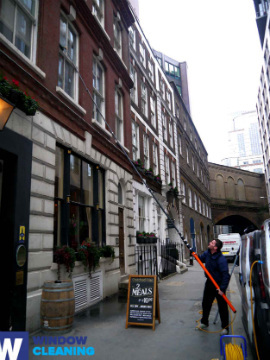 With our experience and expertise, the good look of your property will be achieved swiftly – the experts of commercial window cleaning will achieve this. We employ water-fed extension pole system for fast and well organised window washing, up to the fourth floor. For high-rise office buildings, we use up-to-date rope access methods. With these appliances, we are able to reach the highest glass panes, even on the skyscraper-sized buildings London is known for. From small shops to towering business edifices, we guarantee second-to-none services – take advantage, now! The technicians have the skills and the needed equipment to provide you with both private and business window cleaning. You can count on us for all types of glass surface cleaning. For example, we can polish small or double windows, sash ones, French doors, bay windows and patio doors. In addition, if you have garden glass surfaces, greenhouse or roof windows, we can clean them as well. We use the most advanced ways and the next-generation equipment for all the previously mentioned window types. The professionals of window cleaning use efficient strategies for the process of scrubbing and polishing your glass surfaces, skylights and greenhouses. Our water-fed extension pole feature allows us to reach as high as the fourth floor. The pole is attached to a water reservoir in the van, removing the risk of damage to the exterior of your building. We also use jet washing as part of our window cleaning routine. You can also take advantage of these effective routines. You will see your absolutely clean home after the professional window cleaners in Monument finish their work. We provide the best services for the entire London locality. The leading methods are included in our working routine – including water-fed extension pole system and and hard pressure cleaning. You will surely see the change in your home – we use purified water for the process of inside/outside window cleaning. Contact us today on 020 3746 3113. Our customer service agents will guide you and answer any inquiries. Furthermore, you can use our on-site booking from.